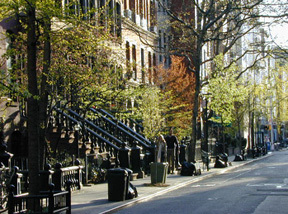 Our New York City vacation rentals are located on Perry Street, a lovely street in the heart of historic and lively Greenwich Village. They are newly renovated, furnished with all the necessary amenities (queen size bed, AC, TV & VCR, phone & answering machine, fully equiped kitchen, spacious bathroom and cupboards). Located one flight up facing some charming gardens. It's like walking into your own ready-made home, in the most charming neighborhood of New York. Finally, they are conveniently located within 2 or 3 blocks of all the major subway lines: in less than 15 minutes you can be at Lincoln Center or down by Battery Park. This and other New York City Vacation Rentals can be found here in The Register.